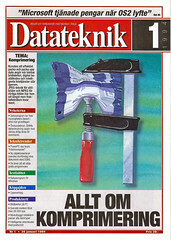 Datateknik 1/1994, January 1994. Cover feature on data compression, by David Nordfors. Lossless compression methods vs lossy methods. Transform methods, JPEG (DCT, Fourier), MPEG-1/2, model coding, fractal coding (making collage, iterating until attractor reached), partial band coding, vector quantization.